Savory, sweet, and just a touch of heat, this Grilled Chicken Salad & Thai Peanut Dressing has it all. 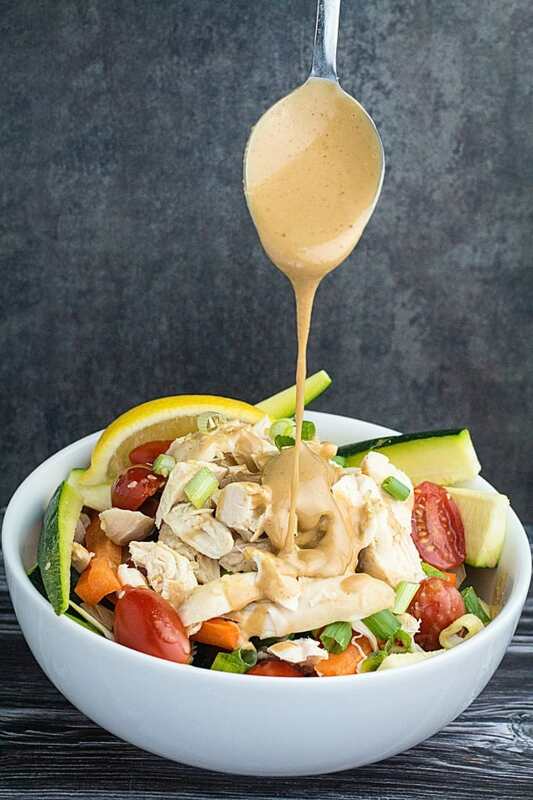 Super creamy texture from a blend of coconut milk and peanut butter, sweetness from honey, savory soy sauce, and just a dash of cayenne pepper give this dressing a flavor combination you’re going to love. 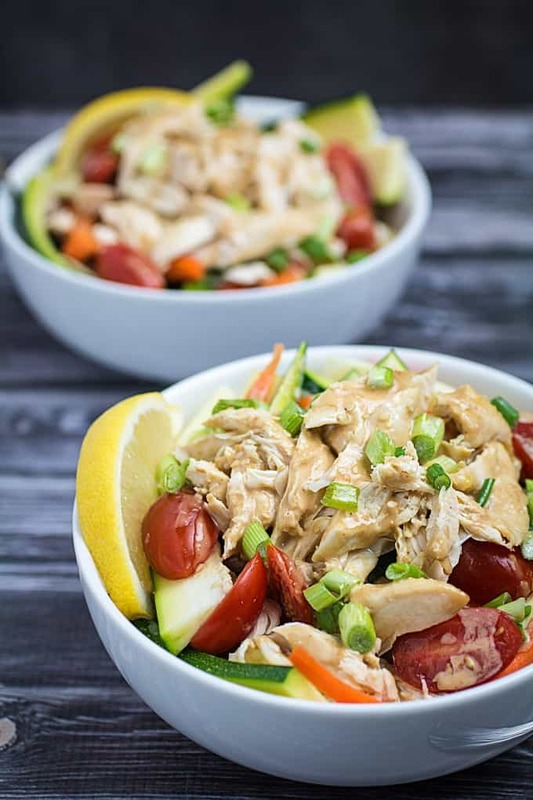 Served on top of a healthy grilled chicken salad, this really is the perfect lunch time meal! That’s how I feel about this Grilled Chicken Salad & Thai Peanut Dressing. I love grilled chicken salad to being with. It’s the perfect light yet completely filling meal that just makes you feel good. Are you ready, though? Because this post isn’t so much about the salad. It’s all about the dressing here, people. The creamy, savory, melt-in-your-mouth peanut-y dressing. Thai Peanut Dressing to be exact. And believe me when I tell you, it is REALLY GOOD. I’ve been getting this little blog ready for Christmas lately. That means an abundance of cookies, cakes, cheesecakes, and all of the other outrageously delicious food that comes with this holiday. Seriously, whoever thought up the idea of Christmas and cookies belonging together, I need to personally thank you. Also, this Gluten Free Slow Cooker Apple Crisp recipe, that I make for pretty much every holiday now. I have a test-cheesecake in my refrigerator right now. I know I need to make it one more time, just to get the recipe exactly where I want it to be (optimal deliciousness). So, I may have to eat this one tonight. You know, to make room in the fridge. And for science. That’s how this works, right? I mean, Nutella. Come on. It was physically and mentally demanding not to eat that stuff straight from the jar when I was making this recipe. Naturally, after all of those sweet, delicious projects, I need something a little bit lighter in my life. A little bit fewer calories, and more nutritious. How else do you run a food blog without outgrowing all of the clothes in your closet? The short answer to that is salad. 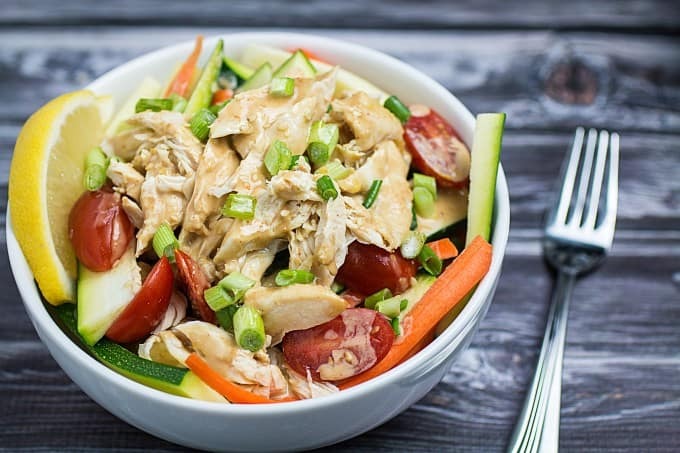 Grilled Chicken Salad with Thai Peanut Dressing. And believe me when I say, salad does NOT have to be boring. There really is an endless amount of things you can put on it if you’re willing to get creative. Today it’s carrots, cucumber, zucchini, and green onions over lettuce. Top with some grilled chicken, and then go to town with the Thai Peanut Dressing. Honestly, I could get a big bowl of raw veggies and just dip them in this dressing and be very happy. It’s that good. Let’s take a minute to really appreciate (and give the appropriate amount of swooning) over the creaminess of the Thai Peanut Dressing. For this recipe, you need to purchase real peanut butter. I mean the real stuff. If there’s anything on the label other than peanuts, salt, and oil, then put it down and back away sloooowly (you don’t want to scare it… whatever’s in there). In all seriousness though, the more traditional peanut butter brands are loaded with sugar, and since we’re adding honey to this recipe, they just won’t taste right. In fact, I’d have to get in the kitchen and re-balance the flavors completely. So, save us all of the heartache and buy the natural peanut butter to begin with. And maybe an extra jar, to eat with a spoon. Savory, sweet, and just a touch of heat, this Grilled Chicken Salad with Thai Peanut Dressing has it all. 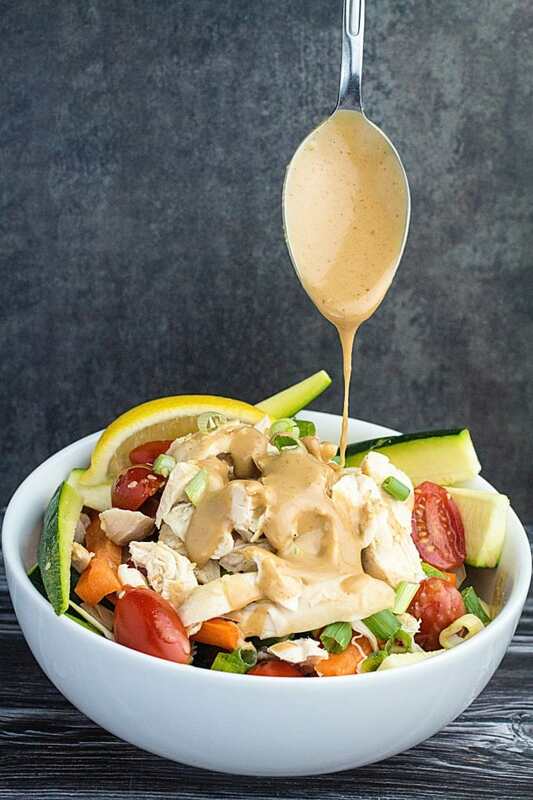 Super creamy texture from a blend of coconut milk and peanut butter, sweetness from honey, savory soy sauce, and just a dash of cayenne pepper give this dressing a flavor combination you're going to love. Served on top of a healthy grilled chicken salad, this really is the perfect lunch time meal! On a grill or in a large pan cook chicken until cooked through (no longer pink in the middle and juices run clear). Set chicken aside. Once cooled, cut into strips. Add coconut milk to a small sauce pan. Cook until simmering, about 5 minutes. Remove from heat. 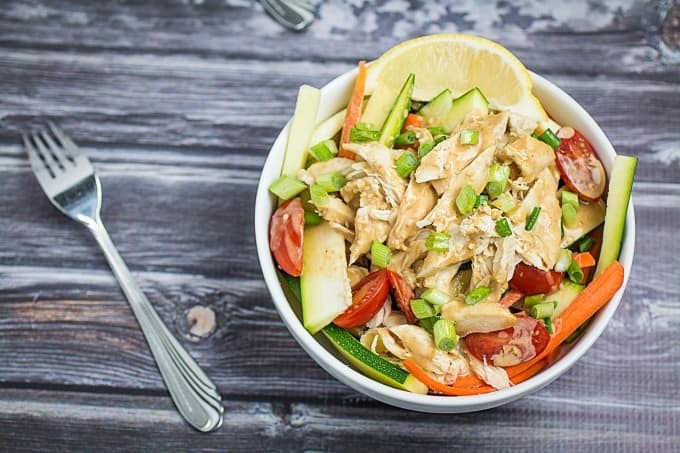 In a food processor or blender, blend together all other ingredients for dressing (peanut butter, honey, soy sauce, vinegar, lemon juice, sesame oil, garlic powder, cayenne pepper). Add hot coconut milk to peanut dressing and blend together. In a serving bowl, mix together lettuce, zucchini, cucumber, carrots, and green onions. 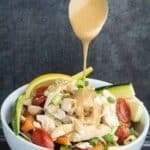 Drizzle peanut sauce over salad to taste. You have to use natural peanut butter in this recipe or it will be too sweet. The only ingredients in peanut butter should be Peanuts and Salt or Oil. Regular brands like Jiffy have too much sugar for this recipe. This recipe makes a lot of dressing, but if you like less dressing on your salad you may have some left over. I recommend dipping veggies into it as a snack! *If you are gluten free, you need to get a soy sauce that specifically says "gluten free" on the label. Many soy sauces contain wheat. I love Thai Peanut Dressing!! It really is good enough to put on pretty much anything, and your recipe looks great! Coconut and peanut butter is such a magical combination. Yuuuum!! Hi Mary Lynne, yes, the chicken and the dressing should freeze fine. You could even freeze it in ice cube trays for smaller portions (I’d also wrap this tightly in plastic when freezing). I would serve it with fresh vegetables, though, unless you use frozen veggies and stir fry them with a cube or two of dressing. Yum!